“Tour parking,“ states the sign at the entrance of the Concha y Toro winery, and more than 40 cars are parked in lines in the parking area. Are their drivers all here for the wine tasting? Our guide Carlos starts with a summary of the company’s history: In 1883, Don Melchor Concha y Toro imported the first vines from Europe. By that time he had already spent 10 years in Chile to prepare the soil and to oversee the building of the 30-room mansion. Today the villa has been restored to its original condition and is used mainly for company events: Concha y Toro has meanwhile grown from a family business to a major enterprise on the stock market. Several visitor groups are circling the premises. The wine tasting takes place at a long wooden counter in the courtyard of the purpose-built visitor centre. The first wine, a Sauvignon Blanc, has tears running down the side of the glass, and it not only smells but also tastes like grapefruit juice. An elderly American with a pouch and varicose pale legs sticking out of his pale shorts empties his glass into the lawn with an inconspicuous swirl of the wrist. The climate and the soil of the Maipo Valley are perfect for Cabernet Sauvignon, explains Carlos between the neat rows of vine hanging with dark blue grapes. “For most grapes, the soil is a disaster: not enough water and no nutriments. But Cabernet Sauvignon likes stress. Just as street kids get stronger with every fight,“ he elaborates. Since Chile is free of grape phylloxera and mildew, in most cases natural weed control is sufficient. At the end of every row of vines, a rose bush has been planted. Roses are susceptible for the same pests as wine and are therefore used as an early indicator for the occasional need to use chemical pesticides. Back at the wine tasting counter, Carlos offers us a Carmenere, a grape variety that has vanished from Europe with the phylloxera plague in 1867. The Carmenere has a deep red colour and tastes vaguely like Hanuta hazelnut wafers. “Nutty flavour,“ confirms Carlos and recommends serving it with pasta and red meat. “But it’s not enough just to think about the food accompanying the wine,“ he urges us. “Consider also the people who will drink it!“ Thin or fat? Blonde or brunette? “For every person there is a perfect wine“ he philosophises. “You, for example –“ He points to a slender woman with mahogany bob. “You should drink Merlot!“ “No Carmenere for you,“ rejoices her friend and attempts to seize her glass. Holding the Carmenere we descend into the 50 year-old wine cellars. Here, the temperature is kept at a constant 11 Celsius, and the humidity is around 95%. Between the rows of wooden barrels, Carlos gets enthusiastic. The barrels are made either from American or French oak and burned out on the inside to enable the wine to take on the wood’s aroma. After five years of use, they are discarded or sold to pisco distilleries. „Do not get me wrong! I have nothing against American barrels – they are square and solid and they do their job! But the French barrels are a dream, you never know where they move!,“ he raves. The best wines are kept in the Casillero del Diabolo, in the „Devil’s Cellar.“ Back in the 1880s, Don Melchor had invented the legend about the devil in his wine cellar to protect his exceptionally good wines form theft. 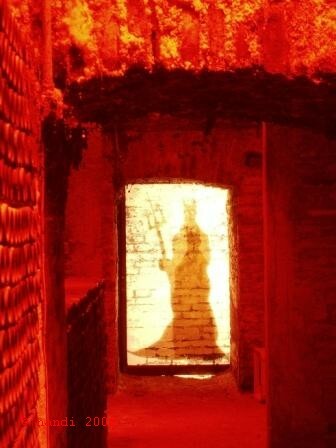 Today nobody believes that the devil hides in the cellar – but perhaps in the details: the label Casillero del Diablo at least sells well. „Until 6 months ago the last wine of the tasting tour was a glass of Don Melchor, our premium wine,“ Carlos admits while pouring us a Marques Cabernet Sauvignon. „But now we have more than 500 visitors per day.“ The Marques sits rich on the palate and then rolls off with a velvety finish. While our fellow wine tasters stroll to the car park, we sit in the sunny courtyard and contemplate a „Don Melchor Wine Tasting,“ with three different vintages, in the Wine bar. The modern church building is filled to the last seat. Congregation members who could not get a place inside are spilling out over the steps straining to get a glimpse of the priest and the mass. Children are merrily playing and chatting, not particularly interested in the resurrection celebrations going on inside. Gradually we push our way into the church building. A group of guitar and accordion players in colourful Hawaii shirts and with Tipane-flowers in their hair play Polynesian songs. “…Maria Rapa Nui, Mariiia Rapa Nui!,” the church echoes. After mass, the papayas and pineapples in the Easter basket are distributed among the congregation. We get a delicious papaya and a mango for our next breakfast, as well as an unripe avocado that even one week in our overheated tent cannot mellow. A look around the carved wooden statues reveals an Archangel Michael wearing a necklace of fresh hibiscus flowers, but we wonder who is the unusual saint next to him with a bird’s beak and wings, arrows sticking out of his body? From the shore right outside Hanga Roa, the main village, Ko Te Riku is staring inland, towards the volcanoes. Today he is the only Moai with (restored) eyes, but like nearly all the huge stone statues on Easter Island he was erected with his back to the sea. The Moai are statues of important ancestors, and they were meant to watch their tribes, protecting them. In groups of 5, 7, or even 15 they stood on huge stone platforms, which the islanders built between about the 9th and 14th century. “The largest statue ever made is 20 meters. Please move on when you have taken a picture.” Groups of Japanese tourists on a Peaceboat cruise are filing through the old quarry on the slopes of volcano Rano Raraku. All of the the more than 700 colossal stone heads found on the island were sculpted here – but about half of them never left the quarry. Some were left unfinished, others stand upright and ready for transport in the low grass. “Could you take a picture of me in front of these two heads?,” a Japanese retiree crusader asks. It is his first trip on a cruise ship and he is enjoying it so much that he is already thinking of doing Europe and the Canadian coast next year. On our way back to Hanga Roa, we stop at several minor ceremonial platforms, thankful for every break from the rickety rented bicycles. Tetanga is lying face down in a pasture, an enormous head apparently abandoned when it was too hard to move. A horse is rubbing his itching side at the giant’s earlobe. 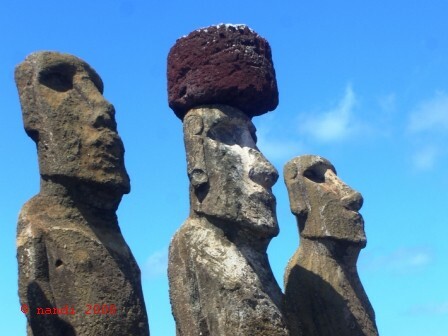 By the 14th century the islanders had used up all the resources on Rapa Nui, resulting in famines, tribal warfare over scarce food and wood supplies, and consequently a radical reduction of the population. The ancestral statues had apparently failed to protect the tribe, and thus the Moai were overthrown, smashed, and their eyes broken out by the inhabitants. Long before the first Europeans set foot on the island on Easter Sunday 1722, the old ancestral worship had been replaced by the new birdman cult. The next day we walk up to the low but more than 100m wide crater of Rano Kau volcano. Wild guavas grow on its rim, and the crater lake is covered by swimming plants. None of the original plants of the island have survived, a sign informs us. The same people who had carved those impressive stone statues had also managed to destroy their environment quite thoroughly. Carved images of a bent-over person with a bird’s beak dot the cliffs around Orongo, a ceremonial village on the rim of the volcano. Orongo was only inhabited for a few weeks each year. During that time, selected athletes competed for each clan in finding the first egg of the sooty tern, a migratory bird nesting on an uninhabited off-shore islet, while the clan’s nobility passed the time dancing and carving petroglyphs until the winning athlete’s master was announced as the birdman of the year, a kind of spiritual leader. But with the advent of missionaries and a few decades of slave trade, in which most of Rapa Nui’s elite was sold to Peru, the birdman cult as well as most of the knowledge of the old traditions died out. The next Sunday, we are back in Rapa Nui’s Catholic Church. There are no Easter eggs, but the carved figure with the beak, we realise, is a revival of at least one of the broken traditions of the island, the birdman cult. When we enjoyed three days on the Navimag Ferry sailing to Southern Chile, we did not imagine how difficult and time-consuming it would be to get back to the North on the overland route. Saturday, 6 am: Our alarm clock rings. We wake up in Puerto Natales, a small town in the far south of Chile. Saturday, 6:30 am: A number of people are already having breakfast in the Hostal Nancy. Their bus for the Torres del Paine National Park leaves at 7:00 am. We, too, slurp down huge mugs of Nescafe, have some Haalulas (Chilean rolls) with cheese and walk out into the pouring rain in order to catch our bus to Calafate in Argentina. Saturday, 7:30 am: We take seats number 14 and 15 and sink immediately into a well-practiced bus slumber. After just over an hour this is disrupted by the border formalities when we cross into Argentina and move into the next time zone, losing one hour. Saturday, 1:50 pm: We have arrived in Calafate and are now researching the possibilities for going north by bus. All the direct buses are booked days in advance. Saturday, 3 pm: We finally decide on a “combination ticket,” a euphemism for having to change buses and bus companies several times and for having to take a detour. “You can leave your bags here if you want,” offers the attendant. 13 hours to go before the first bus of our combination leaves for Rio Gallegos. Saturday, 5 pm: The Casablanca offers wireless internet access and a rich delicious chocolate mousse cake. We order our third espresso that comes in white Italian style designer cups but without the Italian taste. Saturday, 8 pm: We stroll along the main street of Calafate: A casino, three Internet cafes, two supermarkets, about a dozen souvenir shops and some more shops selling outdoor clothes. We have inspected all of them and continue walking up and down now narrowing our dinner choices. Saturday, 9 pm: We have entered Rick’s for the all-you-can-eat salad buffet. The hunchbacked waiter with his drooping eyelid, ill-fitting suit jacket and a dirty beige frottage towel draped over his left arm looks like a character straight from a Kaurismäki movie. We order a bottle of Argentinian Malbec and heap beetroot and egg salad onto our plates. Sunday, 1:30 am: A middle-aged couple enters the Café Balcarce for a quick cappuccino. When they have left, we are again the only customers. It was difficult to find a place that would let us use the electricity for our laptop. Sunday, 2 am: Some of our fellow travellers have been waiting on the wooden benches in the bus terminal for hours by now. It is rather chilly and, when the last bus offices have turned their lights off, too dark for reading. Sunday, 2:30 am: “What are you doing here? ?” an Asian woman sitting on one of the benches cries. We have met Miss Jeong months ago in a backpacker hostel in Costa Rica. She has just returned from Antarctica and enough photos to show and stories to tell to keep us awake. Sunday, 4 am: The reclining seats in the „Interlagos” bus don’t recline at all, but we fall asleep before the overheated bus has even left the terminal. Sunday, 8 am: It is still dark and cold when we arrive in Rio Gallegos. Some people have stretched out on the floor, and the crowded waiting area smells of sweat and cheesy feet. We flee to the overheated cafeteria on the second floor for a morning coffee. Sunday, 9 am: Our Tramat bus for Comodore Rivadavia leaves. After 30 Minutes, right outside town, the bus stops. For an hour, we wait without any explanation, until finally a police car pulls up, and one of the passengers is called out. Sunday, 2 pm: A brief stop in Piedra Buena is a welcome opportunity to escape the sweaty black leather seats of the bus and the air-conditioning that switches between freezer and sauna. After the stop we are handed a plastic package containing pressed white triangles filled with yellow and a brownish layers. A cheese and ham sandwich, we figure out, after hearing an elderly Brit behind us complaining about “double bread in the middle.” Luckily, we brought some food. Outside, the same flat landscape of dry grass with occasional ledges of dry grass has been passing for hours. The second hilarious film starts. Sunday, 9 pm: We arrive one hour late in Comodore Rivadavia. In anticipation of the next bus ride, Isa runs for an open supermarket to stock up our rations. At the extravagantly scheduled departure time of 22:18, our bus to Bariloche is nowhere to be seen. After another 20 minutes of uncertain waiting, the destination sign of a nearby bus is changed from Rio Gallegos (!) to Bariloche, and we can enter and devour our dinner. Monday, 8 am: We have to get off the bus at the bleak bus terminal in Esquila for half an hour, still before daybreak. Monday, 10 am: Two yoghurts and some leftover cheese and soft rolls have to do for breakfast. The coffee available on the bus is a heavily sweetened dark liquid and decidedly not drinkable. 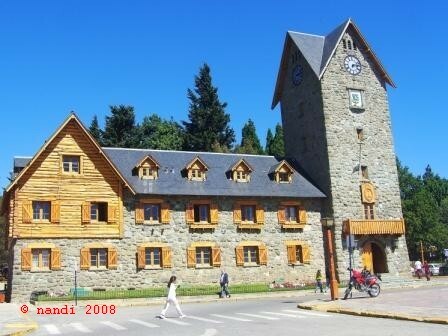 Monday, 1 pm: We arrive in Bariloche (our scheduled arrival time would have been 12:38). We easily find the local bus that goes to the centre of Bariloche, where it takes us only about an hour to find a small holiday apartment with hot shower, kitchen, and well-stocked supermarkets nearby. High above Lago Paine, the Patagonian wind hits: A particularly strong gust sweeps us off our feet and into the aptly named bushes of prickly heath. We lick some blood from our pricked fingers and continue into the valley and towards the campsite at Lago Dickson. It is our first day of the Paine circuit trek in the Parque Nacional Torres del Paine and we have had to change in and out of our rain gear several times during the hike. “So, this is the notorious Patagonian weather!,” we think, nodding off to the sound howling wind and dropping rain. The next day the weather is still unsettled. A skinny Brit is walking in sneakers and with no other rain gear than a “mac in a pack,” a garment like a plastic bag in raincoat shape. He is carrying no tent, and the next campsite where he can rent one is about 10 hours walk away, according to the map. “Oh well, I like adrenalin things,” he says casually while examining his blisters. Although the 6 to 8-day “circuit” is well-marked and not particularly demanding, it is considered as the real “challenge” in the park, and to our surprise we meet no other women-only groups on the trail. In comparison to the more popular “W” route on the southern side of the mountains, there are fewer refugios here, and the trail crosses the often stormy Paso John Gardner, at 1241 meters the highest point on the Paine circuit. When we walk over the pass, we are lucky to have excellent weather and none of the dreaded wind at all. On our way up, we even have leisure to pick some tasty pink berries from those bushes of prickly heath for our breakfast cereals. From the top of the pass we get the first amazing views onto the Grey Glacier. Its fractured ice sheets are stunningly blue, as is Lago Grey, the lake beyond. Chunks of light-blue ice are drifting in the greyish-blue water. A certain type of artificially blue candy popular in our childhood, which was called glacier bonbon, comes to our minds. And indeed, the “Paine” in the park’s name means “pale blue” in an indigenous language. This night we stay at the Campamento Los Guardas, one of several gratis camp sites in the park. “Do you know what is wrong with my stove? Yesterday it worked!” Two boys are fumbling with a liquid fuel stove, complaining that the gasoline is just flowing over. Like them, most of the hikers we meet have apparently never pitched a tent or used a camping stove before renting one from their hostel in the nearby town of Puerto Natales. Their lack of outdoor experience and consciousness of environmental pollution is obvious near the campsites and along the trail. Often the banks of little fresh-water rivers are littered with toilet paper, and we meet people merrily sitting in the streams covered in soap and shampoo, proud to match their own image of a hardened outdoor guy. “Are you coming to the bar? Two Pisco Sour for one during the happy hour – I don’t even know what it is, but everybody is talking about it…,” a German woman is pleading with some new acquaintances. We have reached the W-route, which allows trekkers to move only short distances between comfortable refugios and take in the spectacular lookout points up in the valleys as day trips from there. In this part of the park the agreeable Chilean national drink made from grape spirit, lime juice and sugar is readily available and accompanied by stunning views over the oddly shaped peaks from the bar window. Even Isa admits after the second drink that another two would be entirely acceptable. 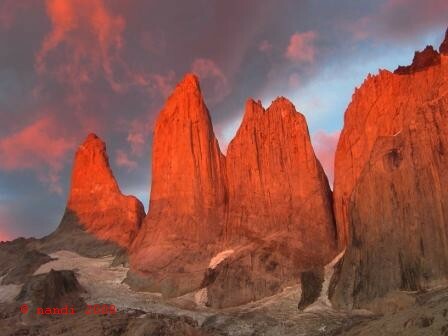 On the last day we get up at 4:45 to see the sunrise at the famous “towers,” the Torres del Paine. At first the rock is just disappointingly grey, but suddenly its colour changes to a baby pink and then into a flaming orange. On our way back to the campsite, we come across some more prickly heath bushes – for a delicious berry breakfast. "Dear passengers! Your attention please! We would like to inform you that now is the right moment to take the seasickness pill. In about 2 hours we will reach the open waters of the Pacific Ocean!" The loudspeaker announcement interrupts a documentary about the Patagonian fauna. Instantly, about half the audience starts to queue at the water dispensers in order to take the seasickness medicine they brought. "You can also buy the pills at the bar on the Upper Deck for 500 Chilean Pesos," the announcement continues. In 1520, when Hernando de Magellan discovered a passage to the west through the Patagonian fjords, he found the sea on the other side pleasantly calm. After crossing through the scarily stormy fjords that he called All Saints Straits (but which were later called Magellan straits), he inaptly named the new ocean the Pacific – or calm - Ocean. We in turn had not heard about the rough open water passage on the second day of the cruise before we boarded the Navimag ferry Evangelistas from Puerto Montt to Puerto Natales. Even now we decide against taking pills in order to test our seaworthiness. About an hour after the announcement a gentle movement sets in, soon developing into an unmistakable billowing. More and more passengers retreat to their bunks. "Nothing special," Daniel, the officer on duty on the bridge, assures us. "Waves of 3 to 4 meters and a wind force of about 30 knots!" 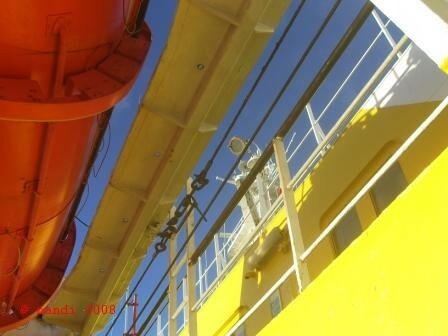 We hold onto a rail while the ship hops forward, its bow dipping into the sea with a noisy white splash. This evening in the dining room, crew members assist the few hungry passengers to carry their laden food trays to the tables. When we ask for a second helping of pasta with pesto, the woman at the counter gives us a surprised look and a generous heap of pasta. Today there would have been more dessert, too. The next morning we enter the Messier Channel and the sea calms down again. "I did not feel all that well, despite the seasickness pills, but at least I could sleep," Karin confides over breakfast. Karin and Erich are on a 3-week Patagonia tour with Chameleon travel, a German tour agency. "Only 12 people," they enthuse. Besides the Chameleon group there are two other German tour groups as well as dozens of individual German travellers on the boat. The ferry company even decided to employ a German passenger attendant for the summer. "On this trip, one third of the 200 passengers are Germans," Lina tells us before going on to explain in German the history of the Cotopaxi shallow. It is named for the English ship Cotopaxi, which hit a rock here in the 1880s – but the shipwreck we are going to see today on the very same spot is the Greek cargo vessel Capitan de Unidas that sunk only in 1963. It looks quite forlorn in these waters, where we have only passed one other ship so far. A few hours later we visit the Pius XI Glacier, the largest glacier in Patagonia with a length of about 15 kilometres. The glacier drops directly into the sea, spreading out over several kilometres at its end. As we approach, the wind becomes icy, and tiny raindrops feel like pelt in spite of an outside temperature of 11 °C. The glacier was explored, presumably by a devout Catholic, during the pontificate of Pope Pius XI. From the deck, we watch the Evangelistas running into the harbour of Puerto Natales in the afternoon of the next day. "Dear passengers! Your attention please..." crackles the loudspeaker. The rest of the announcement is lost in a gush of wind, but it was apparently the signal to disembark: We leave the Evangelistas and hurry to a bus that will bring us even further to the south, towards Tierra del Fuego.